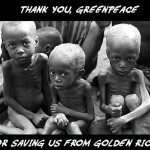 Who is saying no to golden rice? A poignant, outraged article appeared on the blog The Progressive Contrarian a few months ago, and we re sorry we missed it. But the topic GMO food and the agenda- and superstition-based antipathy to it will not disappear, indeed it becomes daily more controversial, so it bears re-emphasis. The piece entitled The dark side of the anti-GMO movement, describes the problem of malnutrition in the Third World, and how one investigator and his small group of scientists has developed a biotech variety of rice to counter one common vitamin deficiency. 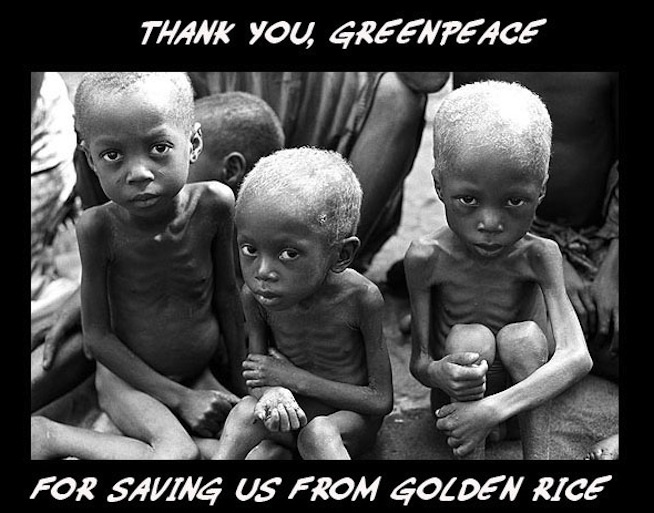 The focus of the article is the well-funded anti-science, anti-human campaign against this advance led by Greenpeace, which has impeded the final steps needed to get this lifesaving Golden Rice out to the infants and children who need it most. What the article did not cover, given its publication date last March, was the phony grass-roots assault on an experimental rice field in the Philippines several weeks ago, which vandalized and destroyed plants groomed to demonstrate Golden Rice s safety and effectiveness in supplying vitamin A precursors to poor children. Yet, the anti-GMO campaigners allege to be concerned about the crop s safety, while destroying fields trying to assess that very parameter. Further the vandal-demonstrators were found not to be farmers or in any way related to agriculture, but activists spurred to action and masquerading as concerned farmers. This devastating setback prompted a petition protesting such violent and destructive behavior, to which ACSH gladly signed on. To lend some perspective to the global reach of anti-GMO zealotry, we are reminded that almost all the countries in the EU have taken action to ban or severely restrict the planting of GMO crops. Some light at the end of the tunnel may be in the offing: the European Food Safety Authority just issued a ruling finding that the Italian government s attempt to ban planting of Monsanto s GM maize (corn) was, contrary to their assertion, not based on science or public health concerns and should be reversed. This advisory will now go to the European Commission for a final judgment: hopefully it will be upheld. ACSH s Dr. Gilbert Ross had this to say: I wouldn t hold your breath, awaiting the EC s final decision. Anti-GMO fervor is so deep in the EU s gut that it will take an awful lot of sound science to make even gradual inroads. We here in the U.S. have a lot of that same baseless fear, but it is not yet official policy, thankfully, despite the best efforts of the mega-business organic lobby. As for the fate of Golden Rice, it s been in development now for over a decade. I wonder how much more research will be needed to convince the fanatics at Greenpeace and their ilk that it should be OK to allow millions of impoverished Asian children to have access to this life-saving product.